Growing up in country South Australia, Dr Kate Grarock took an unlikely path to University, leaving school early and starting a five-year military career. 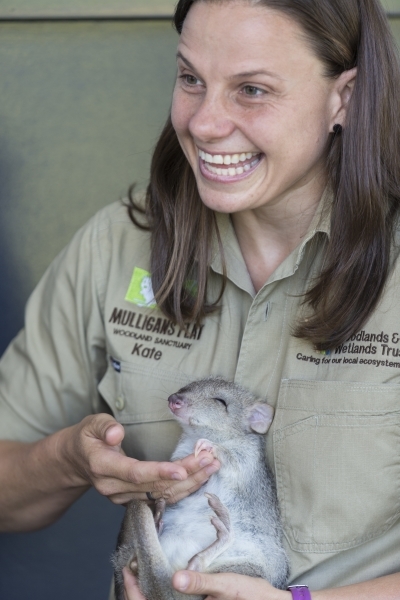 At Wollongong University Kate studied a Bachelor of Environmental Science with Honours, researching Australian gliders. After Honours, she worked in the Federal Environment Department before undertaking PhD research at the Australian National University. Her research produced six scientific papers which focused on the effective management of introduced species. Kate then moved to Hanoi to work with the Vietnam Academy of Science on an environmental modelling and mapping project. Returning to Australia, she was appointed the Sanctuary Ecologist at Mulligans Flat Woodland Sanctuary in Canberra. In this current role, she works on research and restoration of critically endangered grassy woodlands. This work includes reintroducing locally extinct species, such as the Eastern Bettong. Kate has developed a highly successful education program that focuses on sharing science with policy makers, local community, early career researchers and students from preschool to university. Integral to the success of this program is using 'real-life' scientists to deliver education activities. Her team now runs four to five events each week, employing eight female scientists to keep up with community demand. Kate plans to develop this program further, strengthening its links to the school curriculum and creating greater opportunities for higher degree research within the Sanctuary.